Lenape head coach Tim McAneney celebrates with his team after their annual Thanksgiving day game against Shawnee. Like all the best football coaches, Tim McAneney always wanted to do more for his players. Like all the best fathers, McAneney always wanted to do more for his children. The twin demands have driven generations of men from the sideline. On Tuesday, McAneney was the latest to walk away. 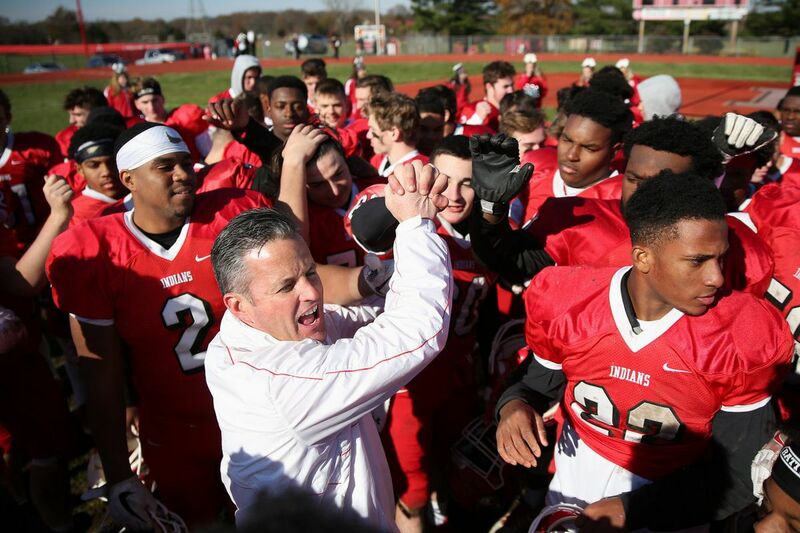 "Time to be a better dad," McAneney said in a text message announcing his stunning decision to resign as the football coach at Lenape High School. In a subsequent telephone conversation, McAneney fought back tears in explaining his reasons. As is so often the case, he started with memories of his father, legendary former Pennsauken coach Vince McAneney. "My world flipped a little bit when my dad died," McAneney said of his father's passing in January, 2016. "I started to think about a lot of different things. "If somebody had asked me four years ago when I was going to give up coaching, I would have said, 'Never.'" McAneney walks away as the most successful football coach in Lenape history. He took the Indians to a new level in his seven years with the program, creating a team renown for its strong defense, powerful running game and fundamentally sound play. McAneney's last team went 11-1 and won the first sectional title in Lenape history with a 10-7 victory over Rancocas Valley in the South Jersey Group 5 championship Dec. 2 at Rowan University. McAneney was named South Jersey's Coach of the Year by the Inquirer on Dec. 17. In seven seasons, McAneney went 51-24 at Lenape. But his impact on what had been a pedestrian program is best shown in the Indians' record over the last four years: 39-6. "Coach McAneney has maintained the highest level of dedication to the student-athletes of Lenape High School and we thank him for his effort, hard work and commitment to the school community these past seven years," Lenape athletic director Brian Laddey said in a statement. A Bishop Eustace graduate who played at Georgetown University, McAneney also was the coach at his alma mater, going 44-48 in nine seasons, and at Holy Cross, where he was 8-3 and won the Non-Public 2 state title in 2008. McAneney said he held an emotional meeting with Lenape players at the school on Tuesday afternoon. "They were upset, shocked, surprised, maybe some of them were angry," McAneney said. "I get that. I don't tell them how to feel. I just explained to them why I had to do what I had to do." McAneney and his wife have four children. He said he felt the imperative to step away from coaching and spent more time with them. McAneney said he was struck by the comments made last month by Cherokee coach P.J. Mehigan, who resigned after 14 successful seasons to devote more time to his children. "My wife and I are reading what P.J. said and I'm like, 'Ditto,'" McAneney said. Echoing so many coaches in recent years, McAneney said the 24/7/35 demands of running a high school program put stress on family life. "I started missing my kids too much the last two years," McAneney said. "It's a weird game now and I don't think there's any changing it. "Today, you have to be completely involved mind, body and soul to coach football." Sounding the same theme that Mehigan talked about last month, McAneney noted that the sport demands full commitment from players and coaches to achieve and maintain success. That inevitably leads to compromise on the home front. "I wish you could have two different worlds and have two different lives but you can't," McAneney said. "You have one." McAneney said thoughts of his charismatic father are never far from his mine, especially when he makes a momentous decision involving his football team and his family. "I think my dad would be proud I'm spending more time with his grandkids," McAneney said.